Zac and a team of volunteers rebuilt a run-down playground after a year of fundraising and planning. William and his helpers created an area with stone benches and a fire ring for the retirement of flags. Paul and his helpers built 60 feet of boardwalk to make the wetland easier for visitors to access. Austin and his helpers built two benches so residents can sit outside. Hank and his team of 24 helpers rehabilitated a nature trail at the James K. Polk State Historic Site. Ernie and his helpers designed and built a special rabbit cage. Alex and his helpers improved the Lake Kyle recreational area at Fort Campbell. Colton and his helpers set up a system of trails of various lengths at their high school. Draven and his helpers installed a large flag pole with a surrounding patio and seating area for a nonprofit. Caleb and his helpers constructed a “Welcome to Williamson” sign welcoming travelers to their town. David and his helpers built an outdoor picnic table with an embedded chess board for a local senior center. Emerson and his helpers built a Gaga ball pit for a charter school. Caleb and his helpers designed, built and installed handicapped accessible planters at a community garden. Matthew and his helpers built a GaGa ball pit for the new middle school. Cooper and his helpers built 150 kennel beds for a local animal shelter. Forrest and his helpers installed native plants at a local county park. Andre and his helpers handmade 135 heat pads and delivered them to four locations of the Animal Humane Society. Alex and his helpers coordinated the renovation of the Arden Road Elementary basketball court. Sam and his helpers organized and hosted a holiday concert for the residents of a hospice home. Nate and his helpers designed and built the Brian C. Thomas Memorial Pollinator Garden at the entrance of Wescott Beach State Park. Logan and his helpers built and placed 80 birdhouses and 20 bat houses at a park in Ohio. Matthew and his helpers built a fire pit, pathway and outdoor fellowship area. Aaraj and his helpers built and donated two portable tables to local robotics programs. Raymond and his helpers re-landscaped four World War II memorials at the Camp Blanding Museum and Memorial Park. 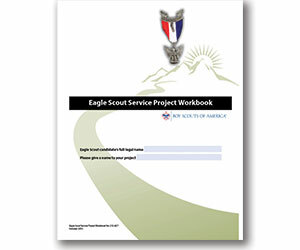 Before you do anything else, download the official Eagle Scout Service Project Workbook (No. 512-927) at scouting.org/advancement. There you'll find a rundown for planning, fundraising, executing and documenting your Eagle project. • Allow you to show planning, development and leadership skills. • Be feasible. You'll need to show it's realistic for you to carry out. • Address safety issues. What will you do to prevent injury? What happens if someone gets hurt? The Glenn A. and Melinda W. Adams National Eagle Scout Service Project of the Year Award recognizes outstanding Eagle projects at the council, regional and national levels. Think your Eagle project stacks up? If you passed (or will pass) your Eagle board of review between Jan. 1 and Dec. 31 of this year, you can apply. 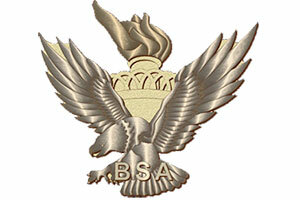 Submit an application to your council's National Eagle Scout Association committee by Jan. 21.